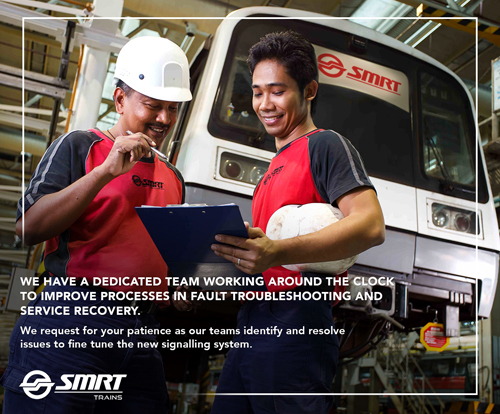 System-level performance checks of the new signalling system have placed SMRT in the spotlight recently. 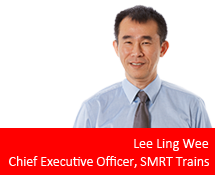 Mr Lee Ling Wee, Chief Executive Officer, SMRT Trains, updated the media at the SMRT-LTA Update on the re-signalling project today (14 July 2017). We share his remarks here. Good morning, members of the media. I just have three key points to make before we proceed with the presentation. Firstly, I would like to thank our commuters for their patience and understanding and seek their continual support as we go through this process of system renewal on the oldest MRT line in Singapore as a nation. I would like to also add that not every incident and delay on North-South and East-West Lines (NSEWL) over the past weeks was caused by the new signalling system. From time to time, we still encounter signalling faults due to the ageing legacy signalling system that is still running part of the East-West Line (EWL) from Pasir Ris to Pioneer station. For example, the incident that occurred on Wednesday morning 12 July between Jurong and Clementi station was due to a track circuit failure, and is not related to the new signalling system on the NSL and Tuas West Extension (TWE). The new signalling system is definitely superior to the legacy system by design because of the system redundancy that it offers. It is important that we get over this transition phase where we rigorously check the system during passenger service and resolve all the initial teething problems. This is a necessary process that we must undertake because the NSEWL is an operational line. Secondly, we have put in place a systematic approach to implement the new signalling system. This includes a comprehensive and progressive plan to weed out teething issues, starting with software testing and verifications in Thales software lab, followed by proof of concept testing on the Changi Airport Line before carrying out engineering tests during off-service hours, and progressing to testing with passenger service from 11 pm onwards. When all these tests were successful, we moved on to full day service on Sundays, progressively increasing the number of trains until we ran a timetable on Sundays that is identical to weekdays with morning and evening peak hour patterns. Along the way, we systematically logged down and investigated every issue that we encountered. For each issue, we develop short term mitigation measures and operational workarounds so as to minimise impact to commuters. We also work out permanent solutions, such as software enhancements, with Thales engineers. Unfortunately, all these may not be obvious to commuters because a delay is a delay and commuters would not be able to distinguish a new category of faults from others that have been mitigated the day before. Later, Alvin Kek, who heads the NSEWL Rail Operations, will share with you some of these issues and explain how we have addressed them. While it may not seem like it, our data shows that delays due to teething problems relating to the new signalling system have reduced over past weeks and we are looking forward to software enhancements that we will be implementing tonight. Last but not least, teamwork. Staff from LTA, SMRT and Thales have been working closely to deliver the new signalling system on both NSL and TWE over the past few months. We have joint meetings and task forces at all levels. During traffic hours, SMRT operations controllers in the Operations Control Centre (OCC) are supplemented by signalling engineers from LTA, SMRT and Thales so that we can quickly react to incidents caused by the new signalling system. Alvin (SVP, Rail Ops, SMRT) chairs a daily meeting involving staff from all three organisations to review new issues in the preceding 24 hours and plan for the activities ahead. Hoon Ping (LTA Chief Executive) and I co-chair weekly meetings with Thales management to make sure that we have the necessary resources to make good progress in this project. There is also a LTA-SMRT joint board committee to look into safety and service reliability issues relating to the new signalling system. As a team, we are sparing no efforts to stabilise the launch of the new signalling system on NSL and TWE so as to minimise inconvenience to commuters. To conclude, on behalf of SMRT, I apologise for the inconvenience to commuters over the past weeks. 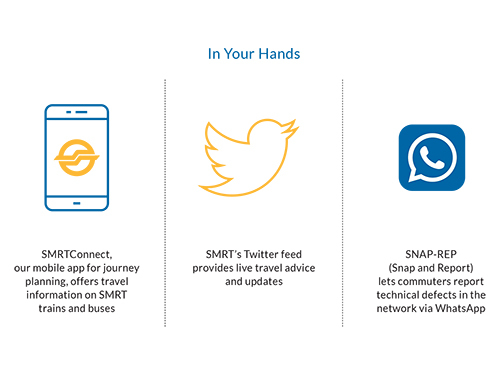 SMRT is committed to serving our commuters. As a nation, this is the first time that we are implementing a re-signalling project on an existing line. We will make sure that the lessons learnt from the North-South Line are ported over to the East-West Line. The completion of the NSEWL re-signalling project will bring long-term benefits to our commuters. These include more reliable train services and an increase in train capacity, translating into shorter waiting time and less platform congestion during peak hours. I would like to assure commuters and the public that as a team, LTA, SMRT and Thales are sparing no effort, working hand-in-hand to iron out teething issues with the new signalling system. Since we began regular system-level performance checks on the new signalling system for the North-South Line, we have received valuable feedback and suggestions from many individuals and organisations. I thought it would be useful to share with commuters the intricacies of implementing a new signalling system on an existing line. Greenfield projects in railway engineering refer to those conducted on completely new lines, e.g. the Downtown Line, while brownfield projects are those executed on existing systems, e.g. the North-South and East-West Lines (NSEWL). New enhancements in a brownfield project would have to integrate seamlessly into a ‘live’ system. A greenfield signalling project typically takes a few months of intensive daily testing involving thousands of hours. For a brownfield project, if we were to restrict the performance checks to only weekends, or engineering hours (i.e. 1.30AM – 4.30AM), it would take Singapore years to implement the new signalling system on the NSEWL. This is why we have no choice but to conduct checks throughout the day, including weekday peak hours, when trains are running at high frequencies with heavy commuter loads. In addition, we have about two million passenger trips on the NSEWL every day. It would not be prudent to shut down the lines for extended hours to conduct the performance checks. My team is now ironing out teething issues with the new signalling system. Every time we encounter a problem, we systematically log and investigate the issue. We then work with the Land Transport Authority (LTA) and system supplier Thales to come up with hardware and software fixes to rectify the issues. When we began weekday checks, we encountered a number of software related issues that affected train services. After joint investigations with LTA and Thales, we managed to identify the root causes and developed operational workarounds while waiting for software fixes to be implemented by Thales. Some – including my own friends – have asked why the re-signalling project takes so long. “Surely SMRT cannot be the first operator in the world to change signalling systems,” they exclaimed. A former classmate told me that one of her friends is now an engineering professor, and offered to have him advise us on this project. I had to clarify that this is unlike the Circle Line incident in 2016 when we dealt with unknown unknowns. We are adopting a planned, systematic approach to identify and rectify the issues in our signalling trials. Each software update is thoroughly tested in the laboratory. It is also tested on the tracks during engineering hours, before being applied during passenger service hours. These fixes take weeks to be delivered. We are planning a software patch in the coming weeks. We hope for a smooth implementation. The procedure is tedious, because no two railway systems are identical in the way they are designed and operated. The system hardware and software we have are customised for the unique local environment. While the system supplier had experience working with other operators in the world, they are unable to simply replicate the well-oiled systems of Taipei, Hong Kong and London, and import those here. Safety is of paramount importance. 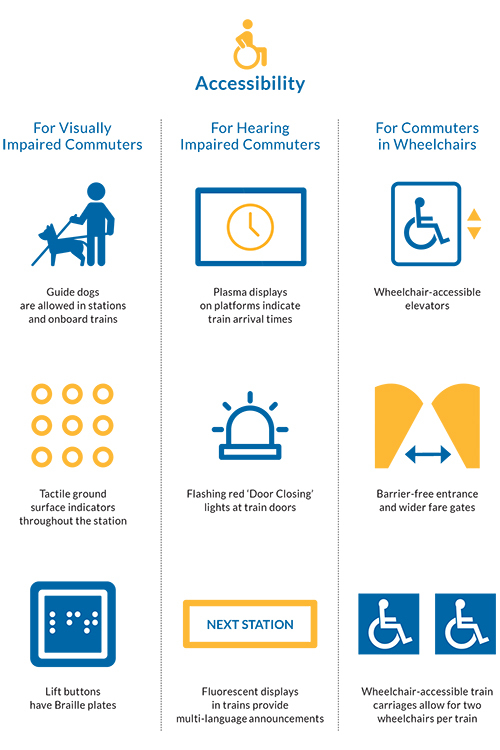 The signalling system is like the brain that commands and controls trains on the network. We will fine-tune the signalling system and ensure that it can accurately track the exact position, speed and braking distance of all trains on the network. It will take us some time, but we are not taking any chances as far as safety is concerned. My team and I have learned a lot from Singapore’s very first re-signalling project. 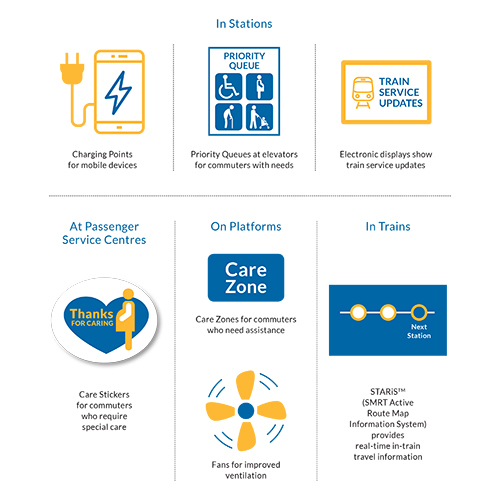 We are keenly aware of commuter feedback and inconvenience due to the ongoing performance checks. 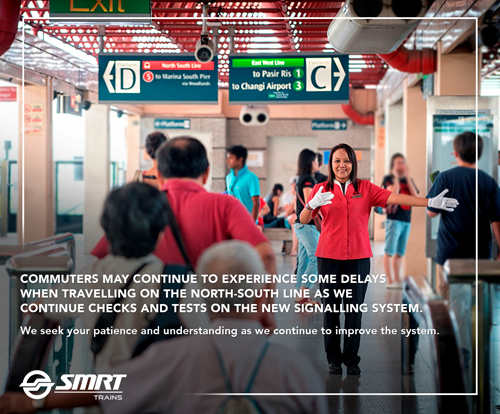 I would like to assure commuters that we are working hard to get over with this phase of system renewal on the NSEWL. We remain committed to completing the performance checks as soon as we can, and to fulfil our promise of providing commuters with better journeys. Thank you for the patience and understanding. Last month, we answered 7 commonly asked questions about SMRT Trains’ new signalling system. As system-level performance checks on the new signalling system for the North-South Line (NSL) continue, we seek to regularly answer the questions you have on re-signalling. 1. Compared to the Circle Line (CCL) and the Downtown Line (DTL), why is it so challenging to run re-signalling checks on the NSL? The signalling systems on the CCL and the DTL were implemented before the lines commenced passenger service. Each line has one type of train, which was easier. On the other hand, the NSL currently has four different fleets of trains. Each fleet has its characteristics, and every train is unique. Moreover, the newer lines run completely underground so they are not subject to inclement weather conditions. In contrast, our NSL operates on both open viaducts and tracks underground. All these factors add to the complexities of our re-signalling project. 2. Has there been any progress after a month of system-level performance checks? • Smoother train braking and acceleration along the viaduct during adverse weather conditions. 3. The Tuas West Extension (TWE) was launched on 18 June 2017. Why was there a disruption on 28 June 2017, just ten days later? Unlike the main stretch of the East-West Line (EWL) which is still running on the legacy Westinghouse system installed since 1987, the newly-completed TWE operates on the new signalling system. This explains why trains moving to and from the TWE will have to pause at Pioneer MRT Station for a few minutes each time to switch signalling systems. On the evening of 28 June, the radio communication network of the new signalling system failed and affected the NSL and TWE. 4. How long more will the re-signalling checks on the NSL last? In a briefing last month (May 2017), LTA shared that a complex system like the new system would take about four to six months to stabilise from the time it is rolled out on a regular basis (29 May 2017). We are not alone in this. Our fellow operators in London and Hong Kong faced similar issues when they renewed their old signalling systems. They also took a while to rectify the issues.